This volume offers an overview of the methodologies of research in the field of military studies. As an institution relying on individuals and resources provided by society, the military has been studied by scholars from a wide range of disciplines: political science, sociology, history, psychology, anthropology, economics and administrative studies. The methodological approaches in these disciplines vary from computational modelling of conflicts and surveys of military performance, to the qualitative study of military stories from the battlefield and veterans experiences. Rapidly developing technological facilities (more powerful hardware, more sophisticated software, digitalization of documents and pictures) render the methodologies in use more dynamic than ever. 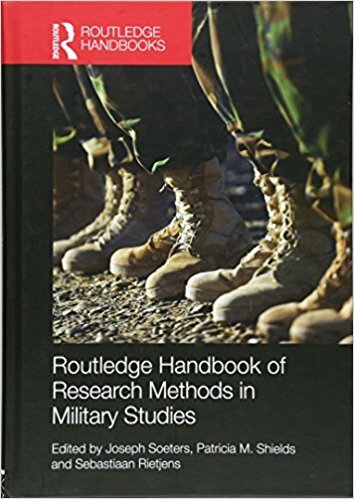 The Routledge Handbook of Research Methods in Military Studies offers a comprehensive and dynamic overview of these developments as they emerge in the many approaches to military studies. The chapters in this Handbook are divided over four parts: starting research, qualitative methods, quantitative methods, and finalizing a study, and every chapter starts with the description of a well-published study illustrating the methodological issues that will be dealt with in that particular chapter. Hence, this Handbook not only provides methodological know-how, but also offers a useful overview of military studies from a variety of research perspectives. This Handbook will be of much interest to students of military studies, security and war studies, civil-military relations, military sociology, political science and research methods in general.